Post by guest blogger, Andrew Johnson. He is the owner and founder of 24 Salt Lake. Photo courtesy of "County Lemonade"
Salt Lake City’s unique emphasis on families gives Utah’s capital city a distinctive atmosphere of fun and adventure. No matter what time of year it is, there is something for everyone to explore. Whether you’re in the mood for outdoor recreation, museums, parks or music, Salt Lake City’s pedestrian-friendly atmosphere makes it easy to make some lasting memories. These are just a few of my favorite things to do, but many Utah news sites like NewsUtah.org have a bunch of other articles on family friendly activities. Be sure to check the Utah weather conditions at newsutah.org/weather before you leave for the day, and have fun! 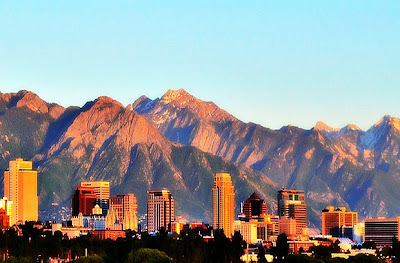 Here is my list of ten things to check out while in SLC. Liberty Park is 80 acre public park system that offers recreational activities for everyone in the family. Whether your idea of fun is hanging out at an amusement park, swimming in a pool or boating on a pond, you can do it all here. The Great Salt Lake is perfect for families of all ages, and there’s so much to do here! Birdwatchers love the variety of birds that can be seen, and there’s also biking trails, chances for horseback riding and, of course, the lake. If your kids are older, and they enjoy improv acting, then a night at Off Broadway Theatre will make a perfect evening. Guests can enjoy comedy from local acts that will have you rolling in the aisles. Located in downtown Salt Lake, Discovery Gateway is the perfect place for children of all ages to discover, imagine and explore. This children's museum allows kids to dig for dinosaur bones, explore an artificial heart and create petroglyph rubbings. Utah's Hogle Zoo is a top tourist attraction in Salt Lake City. It features hundreds of animals from around the world on its 42 acre site. Clark Planetarium is the perfect attraction for families. This five story building offers a state-of-the art 3D IMAX screen and free science and space exhibits. City Creek Canyon provides the perfect opportunity to spend quality outdoor time hiking, jogging or playing volley ball. Seven Peaks Waterpark, formerly known as Raging Waters is the perfect place to cool down on a hot summer day. This water park has rides for thrill seekers, a toddler’s splash pool and a lazy river. It is open from late May to early September. You can never go wrong with a day at the beach. Sunset Beach offers boating, fishing, golfing and paddling. Temple Square is a historic site that's located in Downtown Salt Lake City. From 9 a.m. to 9 p.m. guests can take advantage of exhibits, galleries, concerts, tours, films and organ recitals. Explore, and don't be afraid to try new things with your family. Salt Lake City has so much to offer. What are your favorite places to hang out at? Leave a comment!